ACL + Club Monaco | Made in U.S.A. Collection | A Continuous Lean. If there was one thing I wanted to do with my partnership with Club Monaco, it was to create a collection of clothing that was made right here in the United States. We had to do it. How could we not do it. The good news – the great news – is that Club Monaco was all for it from day one, from minute one. This fall – any day now really – the capsule of shirts, suits and ties will be available at select stores in NYC and at the Bloor Street flagship shop (which will boast an awesome new men’s shop within its historic walls) in Toronto. The collection is based off the existing Club Monaco fits and are built to stand up to the test of time – classic, well made clothing. To give guys a better sense of what we wanted to do with this Made in USA collection we produced a little film to take you into the workshop to see the people and places where these garments are made. This looks really great. I’m guessing if we’re not in NYC or Toronto we won’t really have much access to this? That’s the nature of capsule collection, I know, but I thought it might be worth inquiring a bit more. Congratulations on this! Way to go on the upcoming collection! Being from Canada I am so proud of what Club Monaco has become. Keep up the good work! I didn’t realize they made everything in the US. There is a lot of craftsmanship in Club Monaco products. Respect. They don’t make everything in the US. They make a small collection in the US and most of their stuff abroad. Other large companies do the same. J.Crew, for example, makes all of its men’s ties and belts in the US, but many of their other items come from abroad. This is not to say that there is something wrong with items coming from abroad. And there isn’t anything inherently better about American craftsmanship — just ask all those people driving 1988 Chryslers. What people? I know. Definitely nice to keep communities and traditions alive. Just, do what Club Monaco and J.Crew are doing and don’t go crazy with it. Don’t get it twisted. wow, cool. any idea on a release date? I am in Toronto so will be hitting up the Bloor St flagship store! Wow! Congrats ACL. I sure hope they ship out of NY to a store near me. Would love to check it out at the Philly store if it arrives here. Nice video too. Good work to who ever put that together. I await the Made in Canada line. I know CM were bought out by Americans a decade ago, and are secretly just minimalist Ralph Lauren, but I’m not sure how Canadian consumers are supposed to feel about this when they have their own neglected garment industry. Aaron Levine (CM VP Men’s) and I will actually be up at the Club Monaco Bloor Street store during the afternoon of 11/19 for an event to celebrate the new men’s shop. When I arrive in NY 20 years ago, CM was my go to store for good basics. Unfortunately, they have not kept up with the quality they once I hade I hope this is not just a gimick and your collaboration addressed the need for the consumer for good fitting, quality products. I hope this makes it other stores in the US. NY has its fair share and it needs to reach out to other areas sorely needing style direction and assistance. The shirts look great, congrats. Any day now?? Whats that mean for the NYC stores…. My favourite “mall” brand, and probably the largest player in my wardrobe. Too bad about it not making its way across Canada, considering it started here. Thom â€” it will be available in Toronto. Would love to see them do some select Made in Canada items. Toronto is not even Canada for real Canadians. Way to get things done Michael! That speckled blue tie is first on my list of must haves. And why are Club Monaco’s jackets cut so horribly? The top button is way too high. Club Monaco when it opened in the mid 1980’s was a Canadian company that used to have fairly high quality thick cottons for their casual clothes such as pants, sweaters, and the defining 80’s item – the mock turtleneck. The styles were more avant-garde in the cuts and design then I think, but it could just be my memory forgetting the details. At the time I bought a number of items there, and from what I remember all the clothes were made in Canada for a while. But with the reduction in the garment industry (with most of it centered here in MontrÃ©al) in the early 1990’s, more things started being made in Asia. Once they were sold to Ralph Lauren, the quality did not go up and the styles became more Gap like and less European. All made with thin cottons and cheap seams etc. Which NYC stores and when exactly? Congratulations. The shirts in the top picture look nice. Too bad I don’t live in NYC or Toronto. May I ask, how much thought have you put into the design of your collection in terms of the environmental and human impact of your products? 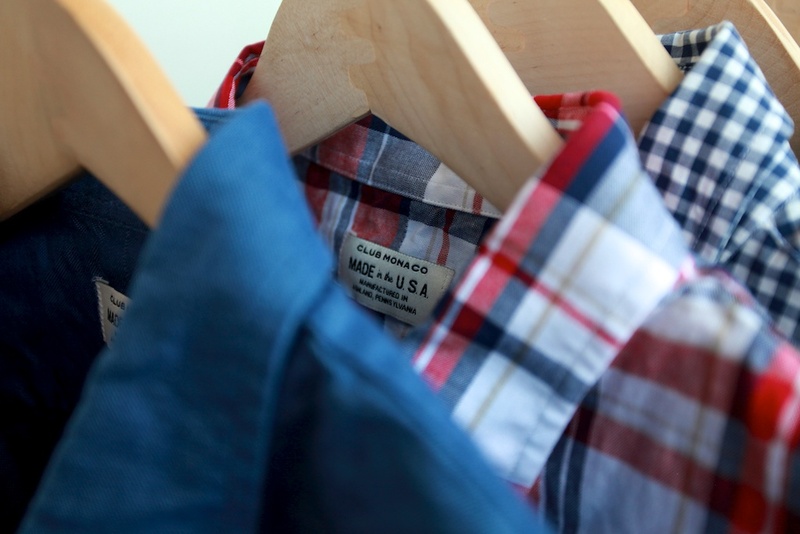 Specifically, are you using conventionally grown cotton or organic cotton? Are your wools chlorine-free? Are you employing low water utilization production methods? Are your fabrics Bluesign approved? I’d love to learn more about this aspect of your collection. I’m confused: Club MONACO/ CANADIAN/ Made in USA? The label looks like one in my old Army fatigues. Also: Sell this collection in San Francisco next season and I will personally buy one of everything. Club Monaco still doesn’t have an online store in the u.s.? yikes. Too bad nothing they sell fits me. I’m 5’9, 150 40 chest, 32 waist — not exactly an outlier — but like the guy above posted, they’re jackets are cut so goddamn weird and their shirts are all wacky. I agree with Daniel — bring this collection to San Francisco. We recently made a list of the nation’s worst-dressed cities, so obviously we need some help. Crazy….so many of my closest oldest friends were associated with Club Monaco over the years….wild…I remember I bought my first pair of jodphurs from C.M. in the 80s…lol…Mike if you are in Toronto you should come visit the secret Himel Bros Cave and come see some of my thousands of vintage jackets…..
Wow, this is incredible Michael. Here’s to other brands following suit. Just tried on their suiting. it’s interesting…fits better then the regular line although where I’m a short size normally and I’m a regular here. Nice fabrics, nothing exceptional but nice for the price. Need to try on one more time to make sure i like. Officially on the racks tomorrow. Happy hunting!! This is such an inspiration for any North American manufacturer! Keep ’em coming! BACK!! Was in the NYC 5th Ave store earlier in the week and the collection is AWESOME! Here’s to American craftsmanship. More more more!!! !